Created in 1993 in the context of the Oslo Accords, the Platform of French NGOs for Palestine (The Platform) aims to mobilize organizations for the recognition of Palestinian rights, especially the recognition of a sovereign Palestinian state on the 1967's borders. La Plateforme des ONG Françaises pour la Palestine (The Platform of French NGOs for Palestine – PFP) does not publish financial information, reflecting a lack of transparency and accountability. The French government (Agence Française de Développement, AFD) provided the Platform with with €270,000 (2017-2020), €225,000 (2014-2017), €199,000 (2011-2014), and €46,560 in 2009. According to AFD, PFP “provides the analytical elements, political and legal, necessary for a good understanding of the situation” (emphasis added). “CSOs [Civil society organizations] receiving AFD funding must mention AFD support and/or the AFD logo on their website (e.g. in the Partners section).” Yet, there is no indication on PFP’s website that the organization is a beneficiary of AFD governmental funding. “The CSO applies a policy of transparency regarding financial information, and this policy is suited to the organisation’s different audiences, e.g. : certification and publication of annual financial statements, publication of summary documents (financial statements and results/balance sheet)… ” PFP, however, does not publish any financial documents. In 2013-2016, The Council of Île de France Region granted €128,000 to the Platform (2013, 2014, 2015, 2016). The Platform is a network composed of 40 French NGOs that are active in the Arab-Israeli conflict. “Raising awareness and informing the public about the rights of Palestinians, and advocating on their behalf to institutions and elected officials. Being a forum for the exchange of information, meetings, and collaboration between French Palestinian-solidarity NGOs and Palestinians organizations. Being a resource hub through its creation of tools for use by members and partners. 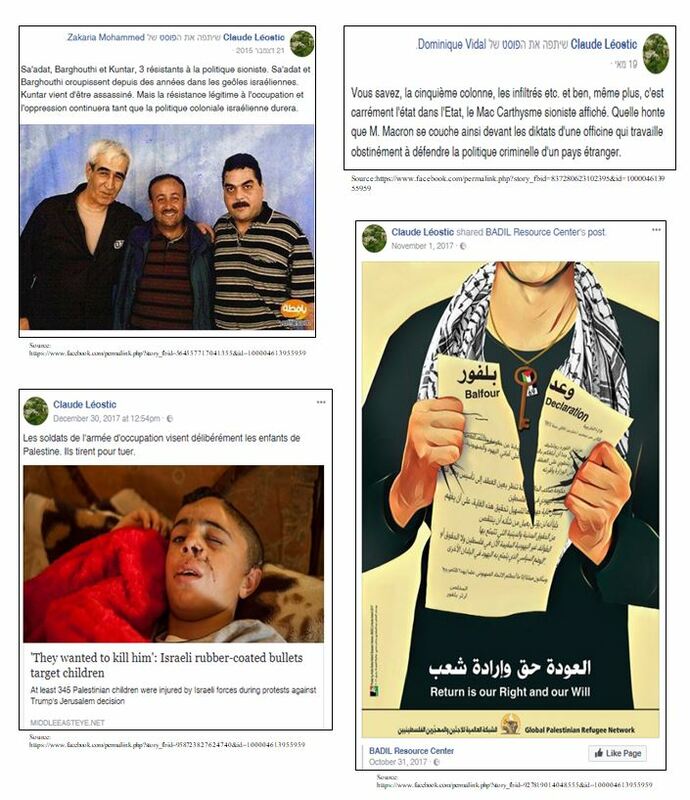 The AFD funded project (2014-2017; €225,000) “Mieux agir pour le respect du droit en Palestine” (Improved Action for the Respect of Rights in Palestine) describes its “target groups” of the project as the “French general public,” emphasizing youth as being particularly important targets, as well as “the media” and “elected officials.” The project indicates that the “impact indicators” of the project are the “increase in the number of questions to the government on the situation in Palestine” and the “increase in the number of journalists calling on the Platform to receive information” (emphasis added). Active in BDS (boycotts, divestment, and sanctions) campaigns against Israel, despite the fact that anti-Israel boycotts are prohibited in France. In 2017, PFP published “12 misconceptions about BDS” which claimed to “present the most common misconceptions about BDS, and elements of explanation to fight against these false claims.” This document refers to the list of deputies and senators so that the reader can question his political representatives on this subject. In April 2017, PFP campaigned to have Israeli soccer clubs based in West Bank settlements expelled from FIFA. Called for the suspension of the European Union-Israel Association Agreement. The workshop was funded through the support of AFD, the Île de France Region, Fondation de France, and Secours Catholique-Caritas France. In July 2018, PFP published a pamphlet, “Palestine: Nakba’s permanent displacement,” promoting a Palestinian “right of return,” with the support of AFD and the Fondation de France. The pamphlet contained many historical and factual errors, such as the claim that the UN’s 1947 Palestine-sharing plan was “rejected by Arabs and Jews,”1 or that “the use of the word ‘Nakba’ is still prohibited in Israeli textbooks.”2 The pamphlet also falsely accused Israel of forcibly displacing Palestinians, claiming that “the Nakba is an ongoing process” (emphasis added). Claude Léostic, PFP President and national council member of the Association France Palestine Solidarité (AFPS), frequently expresses sympathy to terrorists, and makes highly offensive and controversial remarks (For more details, see “Les dérives radicales de la Présidente d’une association française” (“The radical slides of the President of a French organization”). Comité Catholique contre la Faim et pour le Développement – Terre Solidaire (CCFD): Partners with politicized Israeli and Palestinian NGOs, such as Zochrot, a promoter of a “one state solution,” and HaMoked, which makes inflammatory and inaccurate allegations of Israeli “apartheid,” deportations,” “torture,” and forcible transfers.” Since 2014, CCFD -Terre Solidaire has funded the Israeli NGO Breaking the Silence, which publishes unverified and unsubstantiated accusations against Israeli soldiers. Pax Christi France: Compares the situation in the Palestinian territories to the occupation of France by Nazi Germany during World War II and to apartheid South Africa. Union Juive Francaise pour la Paix (UJFP): Accuses the State of Israel of being an “apartheid state” and of “ethnic cleansing.” Supports BDS campaigns against Israel. In 2013, UJFP funded the Alternative Information Center (AIC), a Palestinian NGO with alleged ties to the Popular Front for the Liberation of Palestine (PFLP) terror group. La Cimade: Presented its 2015 report titled “The Occupation is Walling Up the Future: Survey on the Threats of the Colonization System and the Resistance of the Civil Societies” to the French Senate. The report recommends that France recognize the legitimacy of BDS campaigns against Israel, accuses Israel of “ethno-nationalist policies,” and recommends that the European Union “suspend all economic aid or cooperation agreements between the EU and the State of Israel contributing directly or indirectly to the maintenance or development of settlements in the occupied territories and in Jerusalem.” La Cimande acknowledges the Platform for its “logistical support” in the report. The NGO also thanks Michel Warschawski, AIC’s co-director, and UAWC – two NGOs with ties to the PFLP terror group. Secours Catholique- Caritas France (SCCF): Supports BDS campaigns against Israel, such as the “Made in Illegality” campaign (mentioned above) that demands that France “stop import of goods from the occupied Palestinian territories.” SCCF also supports a project in cooperation with the politicized Israeli NGO Sadaka Reut. PFP partners with Palestinian NGOs Network (PNGO), an umbrella organization comprising 67 Palestinian NGO member organizations, which prohibits its members to sign funding agreements that included the Anti-Terror Certificate. The current AFD funded communication file project (available on file) indicates that PFP partners include the Palestinian NGOs Addameer, DCI-P, and Al-Haq, all members of PNGO and with ties to the Popular Front for the Liberation of Palestine (PFLP), a terrorist organization designated as such by the US, EU, Canada, and Israel. PFP has also partnered with Ittijah and the Civic Coalition for Palestinian Rights in Jerusalem. Ittijah director Amir Makhoul was sentenced nine years in prison for spying for Hezbollah during the 2006 Lebanon war.